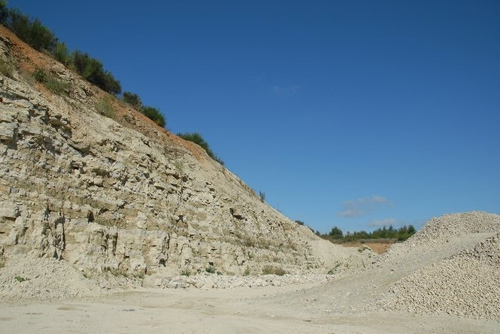 Opened in 2001, and closed in 2005, the Blaise Farm Quarry is in near horizontal rag and hassock facies of the Lower Cretaceous, Hythe Formation. Faces display large scale (up to 2m high) cross bedding, channelling and extensive bioturbation. Such features indicate deposition on a shallow marine shelf where sediment transport was to the east or north-east. 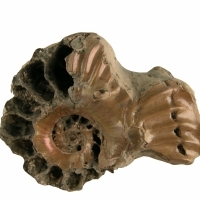 The top surface of the Ragstone deposit is cut by numerous 'solution pipes, up to 4m wide and 6m deep, filled by brown-orange clay, rotten-stone and debris, and draped beds of rag and hassock. These and similar pipes in the Chalk were formed by sub-aerial weathering during the Tertiary and Quaternary. At Blaise Farm, unlike chalk sites, the Karstic features are readily accessible. Access is from the roundabout on the A228; the quarry is sign-posted and is reached by a wide, 800 metres long, metalled road. The quarry is now closed and the main gate is locked, so permission to enter is essential. Inside the quarry the rock faces are stable but with some falls from the overburden and weathered rag and hassock. All studies should be conducted from the roadways or ground level away from the bases of the faces. Hard hats, boots and reflective jackets are essential.